← Glad you asked that: Please help me understand how my Janome Buttonhole foot works. I’m often asked which is my favourite Janome presser foot, and it’s never a quick, easy answer. It’s like being asked which of your kids is your favourite. You love them all equally, right? RIGHT?! lol! Well, I do indeed love ALL of Janome’s huge selection of presser feet as they each do something unique. Some of my all-time favourites near the top of the list have always been the fabulous AcuFeed Flex feet . Since there is more than one, and I’ll show you photos of each. There are two foot holders in the AcuFeed Flex system; Single/Narrow and Dual/ Twin. The Acufeed Flex system was another ingenious Janome development. They took the even-feeding action of a regular walking foot and amped it up, or, as I say, it’s like a walking foot on steroids. 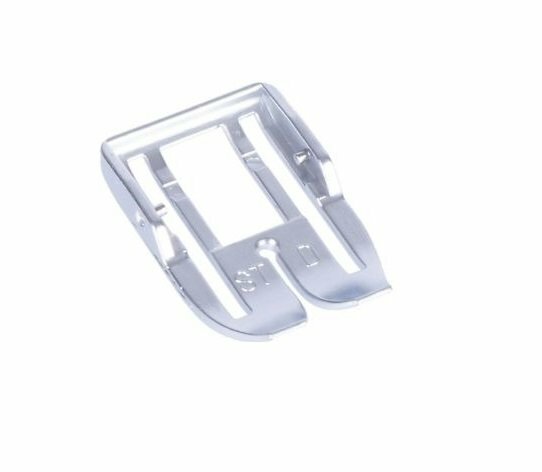 The ingenious part is the Flex in AcuFeed Flex: each of these holders has a variety of feet attachments or sole plates which easily snap in and out for various applications. How cool is that? Janome thinks of everything. 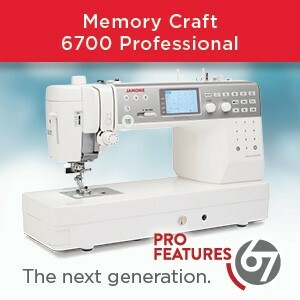 This gives you the ultimate in Flex-ability with whatever you are sewing! Our fabulous Janome Artisan, Kim Jamieson-Hirst of Chatterbox Quilts demonstrates this in the video linked here. 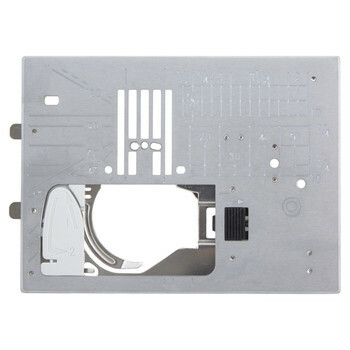 Many Janome machines such as the MC 6700P, the Horizon MC 8900QCP, and the Horizon MC 9400QCP come with the Dual/ Twin AcuFeed Flex holder and corresponding AD foot as standard, (as pictured above) but you can also purchase the Single/Narrow holder with corresponding VD foot for those 9mm machines as well. 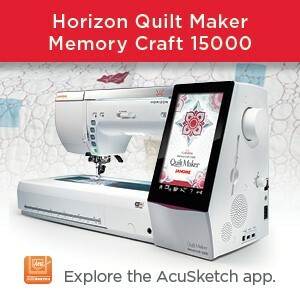 The top-of-the-line Horizon MC 15000 Quiltmaker comes with both. As always, please visit your local Janome dealer for more information. I recently used the Single/Narrow AcuFeed Flex foot holder with VD foot when I quilted a placemat. Position the needles so that the space from the needle to the right edge of the foot measures a quarter-of-an-inch. I used the edge of the foot as a guide for parallel rows of quilting. I also could have used one of our Janome Quilting Guide Bars. 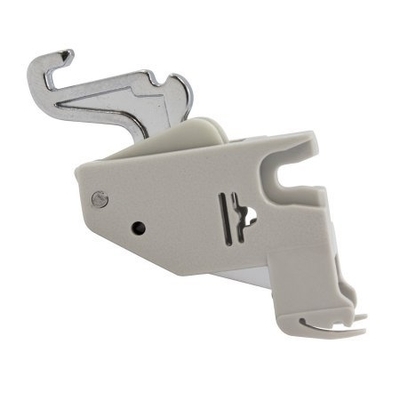 This is a great foot to use when sewing in tight spaces, like inside bulky tote bags, or, switch out to the AcuFeed Flex ED Zipper Foot to easily install a zipper. The Dual/ Twin AcuFeed Flex holder has a variety of feet available. If they did not come with your machine, please visit your local Janome dealer to see what selection they have in stock or can order in for you. Since we all like to see where we’re going, the AcuFeed Flex UD foot has an open-toe for greater visibility. It’s perfect for decorative stitching, as in the case with the thick denim layers in the photo below. The AcuFeed Flex OD foot is the one I use all the time when sewing my binding to my quilt. I love having the metal guide at the edge of the foot to help me sew in a straight line, especially when sewing at top speed as I generally do. The hole in the centre of the foot allows you to move your needle in multiple positions to the left or right, which is perfect if you want a quarter-of-a-an inch, a scant quarter or more or less for your seam width. The AcuFeed Flex STD foot is for use with the Straight Stitch Needle Plate. Notice the corresponding hole in the centre of the foot and the plate. Now, if you were to purchase a new top-of-the-line Janome Horizon MC 15000 Quiltmaker you’d have both of these glorious, super-useful AcuFeed Flex foot holders + many of the sole plates at your fingertips. Easy! But, never fear, ALL of these feet are available in separate 9mm blister packs as optional accessories so everyone can share in the fun! Don’t have a 9mm machine? Visit your local Janome dealer to see what options they have available for you. For another placemat sample I sewed recently I used the AcuFeed Flex SD Ditch Quilting Foot to help me quilt nearly invisibly through all layers by stitching in the ditch of my piecing. SO many feet, SEW little time! Do YOU have a favourite? Comment below to let us know. 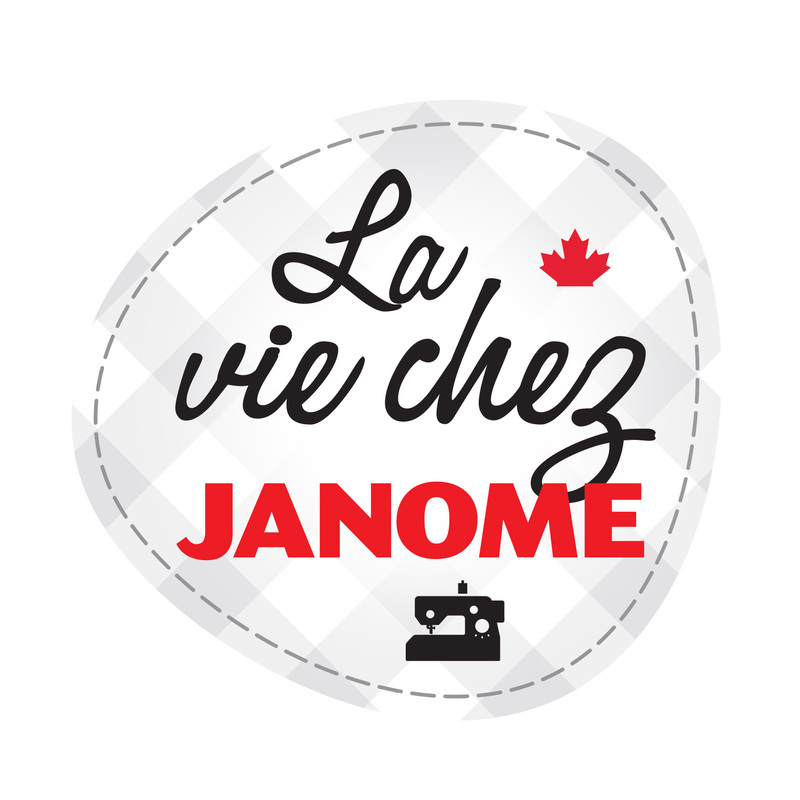 What will YOU create with your fabulous Janome presser feet today? 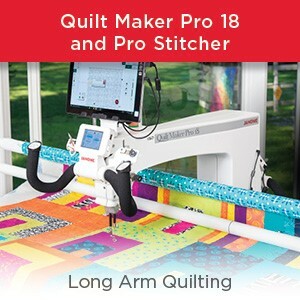 This entry was posted in Janome Acufeed Flex and tagged ACUFEED 1/4 INCH FOOT, ACUFEED FLEX DITCH QUILTING FOOT, Acufeed flex foot by Janome, Acufeed Flex foot for MC8900, ACUFEED FLEX OPEN TOE FOOT, ACUFEED FLEX WITH JANOME, ACUFEED SYSTEM, Janome 15000, Janome 6700P, Janome Acufeed flex foot AD, Janome Horizon MC 9400QCP, Janome MC 9400, Janome MC15000 Quiltmaker, Janome sewing machines. Bookmark the permalink. Great article, Michael – and thanks for the mention of my post on a similar subject. Don’t you just love the AcuFeed Flex feet for the Janome machines?! Liz, your blog posts are fabulous! Your descriptions of features, such as these presser feet, and the clear photos are so terrific for beginners and those of us with a bit more experience alike. I so enjoy reading your posts and I agree…..the Acufeed Flex Foot is truly miraculous! Thanks, Kimberly although I must say that not all the posts are written by me. I have a talented team of educators and artisans as well as guest bloggers who produce wonderful material for janomelife. Erin and Michael wrote the posts this week on the Buttonhole foot and the Acufeed feet. Glad you like the posts and, yes, we try to aim at supplementing what our dealers offer to both beginners and more advanced sewers and what we teach and promote when we do shows & dealer store events. I purchased a Skyline S7 just a little over a year ago. The AcuFeed Flex Foot is far and away one of my favorite things. The first time I used it, the heavens opened and the angels sang 🙂 No more headaches with a walking foot. I actually find excuses to use this because I love it so much. Thanks, Janome. You rock! We love your enthusiasm and we agree with you! !